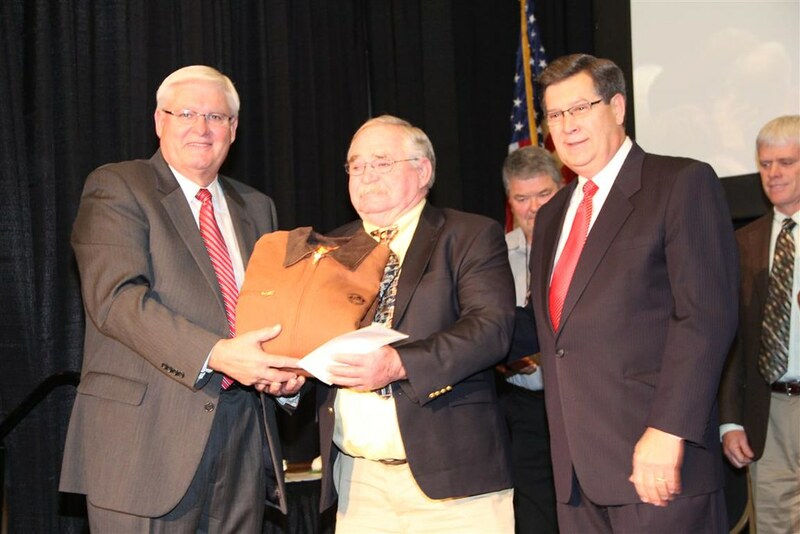 Louisville, KY (December 5, 2014) – Jack Trumbo, a 64-year farming veteran of Shelby County, was honored as the 2014 Kentucky Farm Bureau (KFB) “Farmer of the Year” during the organization’s 95th annual meeting in Louisville. Jack Trumbo (center) received the 2014 “Farmer of the Year” Award at Kentucky Farm Bureau’s annual meeting in Louisville. Presenting the award is Mark Haney, KFB President (left) and David S. Beck, KFB Executive Vice President (right). Trumbo grows cereal rye, corn, soybeans and winter wheat on his 2,170-acre farm based in Shelby County. Starting out on his father’s family farm at the age of five, he had his hand in farming in some way for many years before diving into full-time farming at the age of 42. With the help of his wife, Gwyn, to handle the finances and paperwork, Trumbo quickly grew his operation to several thousand acres with land in five surrounding counties. Land management is a focal point for his farm today, and incorporating practices like seasonal crop rotation, 100% no-till farming, waterway maintenance and the creation of buffer zones have helped minimize erosion and runoff. He has also taken advantage of technology as it became available and affordable, including the introduction of auto-steer, variable rate and geo-spatial applications to reduce the waste of fuel, fertilizers, herbicides and seed. Trumbo additionally expanded his business to include planting, spray application, harvesting and bush-hogging to assist neighboring farmers. He also partners with other farmers to bale, store and deliver wheat straw for the horse industry and rye straw for landscaping. Known for a desire to share his farming knowledge and experience with those who need it most, Trumbo found several ways to help promote the agriculture industry near and far. He has invested his time, wisdom and even resources into the lives of several young farmers locally. He became active in organizations like KFB that provided opportunities to personally lobby legislators in Frankfort and Washington, D.C., about farming and rural issues. Trumbo also traveled the world, learned more about international trade markets, and, with the humanitarian arm of the American Soybean Association, joined its efforts to develop ways to provide more soy protein into the inadequate diets of many Central American children. Trumbo has been an active member of the Shelby County Farm Bureau board of directors since 1994 and served as its president for four years. He is currently a member of the KFB Soybean Advisory Committee, past-president of the Shelby County Extension Service, and is a 30+ year member and past master of the Wingate Masonic Lodge #161. He has additionally served since 2000 with the Kentucky and American Soybean Association boards, and he is currently a member of the World Initiative for Soy in Human Health Committee and his local USDA Farm Service Agency county committee. Trumbo has often given of his time and talents to many other industry-specific and community organizations. Judges visited the “Farmer of the Year” finalists during the fall to conduct interviews and see each operation firsthand. The KFB Federation awarded Trumbo with a $1,000 prize for being named “Farmer of the Year,” and the other finalists, Cooper and Lowry, received $250 each. All three finalists were also presented with a KFB jacket. In addition to the statewide recognition and prizes, KFB’s “Farmer of the Year” winner will represent Kentucky in the Swisher Sweets/Sunbelt Ag Expo Southeastern “Farmer of the Year” contest, the South’s most prestigious agricultural award, in Moultrie, Georgia, October 20-22, 2015. This year’s state winner received $2,500 from Swisher International, one year’s use of a Massey Ferguson tractor, a $500 gift certificate from Southern States Cooperative, the choice of either $1,000 in PhytoGen cottonseed or a $500 donation to a designated charity from PhytoGen cottonseed, and a Columbia vest from Ivey’s Outdoor and Farm Supply. Kentucky’s winner will compete against nine other state winners for the chance to win a $15,000 award from Swisher International and several other sponsor-based prizes. Cooper is a 24-year farming veteran from Lincoln County, entering full-time farming after buying into the family partnership in 1990. Today he raises a sizable herd of stocker and background steers and grows alfalfa hay, silage and shell corn, soybeans, tobacco, wheat and wheat silage on his 1,083-acre farm. He has been a member of the Lincoln County Farm Bureau board of directors since 1991, serving as its president for nine years and vice president for seven. He is currently president of the Lincoln County Fair Board, a director of the Lincoln County Cattlemen’s Association, a member of the county’s Extension Council, Ag Development Board and Beef IRM Committee, and has offered additional time and leadership to numerous other local organizations. Lowry, a 38-year farming veteran from Graves County who started out in 1976 with a tobacco crop and 250 acres of land, has grown that initial investment into a self-sufficient 9,200-acre corn, soybean and wheat farm. Lowry further diversified his efforts by acquiring a fleet of trucks to haul fertilizer and seed beans, and also purchased equipment to run a small excavating business. His two sons and their wives have recently joined this family effort and together they seek to build upon his success. Outside of the farm, Lowry has served on the Graves County Farm Bureau board of directors for 20 years, including 10 years as its secretary and treasurer, and is known throughout the community as a generous individual who is actively involved in numerous fundraising projects to assist those in need.